DRPU Gate Pass ID Cards Maker & Visitors Management Software design visitor's ID cards and Gate pass for your visitors. With the help of this software, you can easily manage all incoming and outgoing planned or unplanned visitor’s from your office or company. Software provides option to add all the visitor's details to the database for future usage and manage your visitor's records. 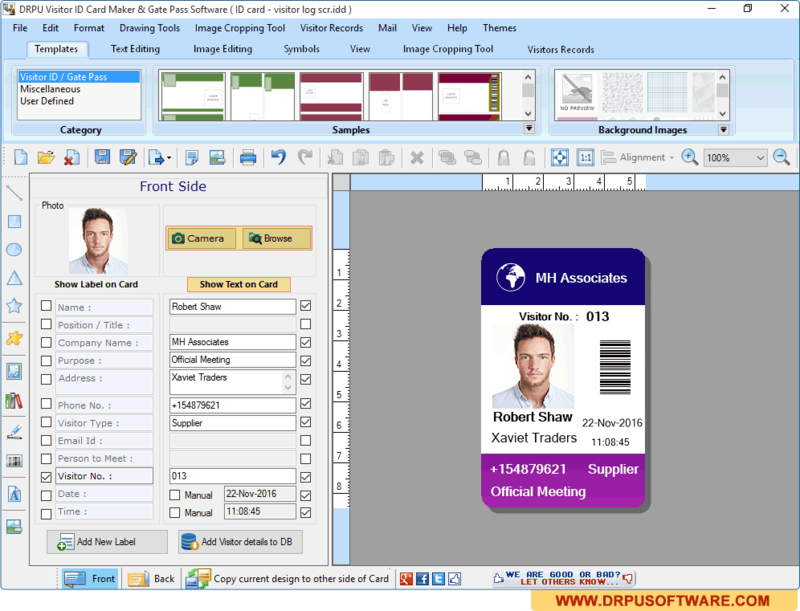 While Designing ID card, You can also capture image of your visitor using camera and crop image according to your requirement with the help of Image Cropping Tool. Print designed visitor ID cards using flexible print setting option. Software provides option to capture photo of your visitor for designing ID card or Gate Pass. Software is having inbuilt E-mail setting feature to send designed visitor ID cards at specified email address. Design visitor ID Cards using designing tools including Rectangle, Ellipse, Triangle, Symbols, Signature, Barcode, Watermark etc.